Have you ever tried almond milk? The taste is a velvety creamy taste with a hint of almonds. It can be sweetened (If I sweeten my I like to use honey, raw cane sugar or even maple syrup), it can also be flavored with vanilla or even chocolate. I find the taste of almond milk to be absolutely divine! I would even go as far as saying it is addictive. The first time I tried almond milk was about one year ago when I bought a liter from my local organic market. I knew immediately that this was going on my rotation of non-dairy milks. Last June I shared my recipe for raw Almond milk, and it has been one of my most popular post to date. 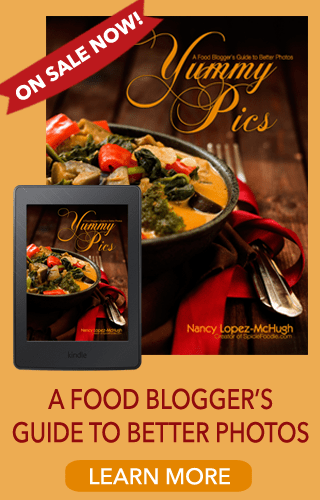 The recipe that I shared works perfect and it is hassle free. But for some reason when I added the almond milk to my tea or coffee it would separate. The taste is still great but it’s not the prettiest looking thing. (I should note that as the almond milk sits in the refrigerator it does separate, but a quick shake and it’s ready to drink. ) I experimented with warming up the almond milk before adding it to the tea (coffee) or pouring the brewed tea (coffee) into the almond milk. Both of these methods prevented the separating but it was a pain having to dirty extra dishes or when I just wanted a quick splash. Then the lightbulb when off, cook the almond milk. Viola! This yielded non separating thicker almond milk. 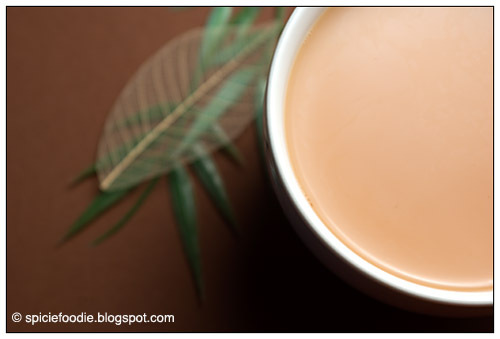 Cooking or boiling the almond milk prevented both the separating in tea, coffee as well as preventing the almond milk from separating as it sits in the refrigerator. My recipe for non-seperating almond milk is the same as the raw almond milk, obviously the only difference being that at the end the almond milk is boiled. Here is the recipe (doubled) or you can also find it in my archives here. Making almond milk at home is not only super easy, but also much cheaper than buying it at the grocery store. 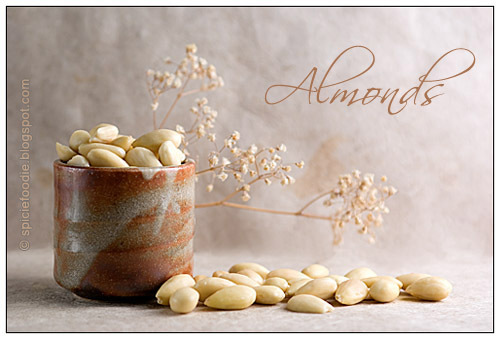 Place the blanched almonds in a large bowl and cover with water. Leave to sit overnight. Drain the water, and place the almonds in a blender. Pour 2 cups of water into blender, and if using sweetener add it to the blender as well. Blend until the almonds have completely broken down to a fine almost paste. Place the cheese cloth (or other options) over a large bowl. Pour the liquid over the cloth, then pull up on all ends to squeeze out liquid onto the bowl . Once the liquid is all removed, place the ground almonds back inside the blender and add the remaining 2 cups of water, again repeating the process. Pour the almond milk into the pot, partially cover and under low heat simmer for 15 minutes. Keep a close eye on it as it may boil over. Stir now and then. Allow to cool before storing in the refrigerator. The almond milk will keep fresh in the refrigerator for 5 days. Last time I also advised you not to discard the ground almonds because you can used them in baked goods. Or also “An option is to dry the ground almonds then once they have completely dried place them back in the blender and blend into a fine almond flour. Again this can be used in baked goods or any other recipes that might call for almond flour.” I have used the leftover ground almonds in a couple of recipes. I will have them written up to share with you very soon. You may be wondering how to use the almond milk, just like you would cow or soy milk. My favorite way is to just enjoy a cold glass of almond milk, but I have used it in baking, cereal, muesli, and I’ve seen some people adding it soups. I will experiment further and get back to you. 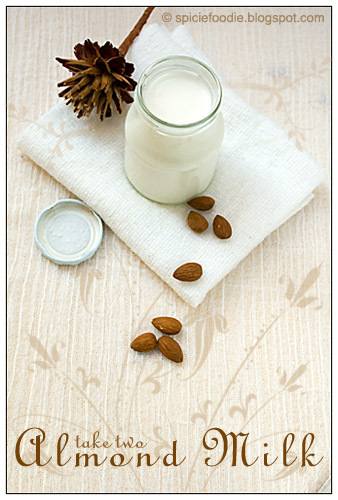 But now go on and enjoy some delicious, healthy, no preservatives, homemade almond milk. *Update March 11 : Click here to see how you can use the leftover ground almonds, Chocolate Craisin Almond Cookies. wow Nancy..this is really really awesome! for a few mounts now we are only drinking almond milk and since my 4 year old don't eat meat at all it was kind of replacement of protein. But I never made it myself..looks easy when you explain how! Will try this! Amazing photos, so rustic and professional! This is the first time I hear of almond milk. Looks so simple. @Victor, Thank you and you should try it, it's delicious. So does by boiling the milk doesn’t that kill all the nutrients in it? You are not boiling the milk, it is low heat and just simmering it. If you would like you can just use and drink the milk after straining it. Enjoy! Hi Nancy! It's been a while since I last visited. Thank you for this recipe for homemade almond milk! My husband loves almond milk and i think this would be fun for the two us to make together. Hi Roxan, It's been a while since I visited you as well, I'll be stopping by later. Yes it would be fun for you guys to make, and a great treat to enjoy together. You know, I've never had almond milk but now I'm curious.. I think it sounds like it would be delicious over some granola! @Fresh and Foodie, Thank you and you should try it. @Evan, Yes it's delicious over granola! I really want to try this. REALLY REALLY want to. It's just that almonds are so expensive right now. So I'm left with drooling over your picture for now. Love it! That looks lovely. I am loving this recipe. This is gorgeous. I love almond and I bet it ca taste good. I have never had almond milk but you have convinced me to try this. @Fooddoodles, Thanks, I have to write up the recipes in the coming days so I can share it. Very interesting indeed. I can't say I would have thought of making this myself and I am glad somebody. It was my something new for the day! I have never tasted almond milk but it sounds delicious. I have granola every morning with vanilla yogurt, but I bet this would be an awesome variation. Thanks for sharing the recipe! 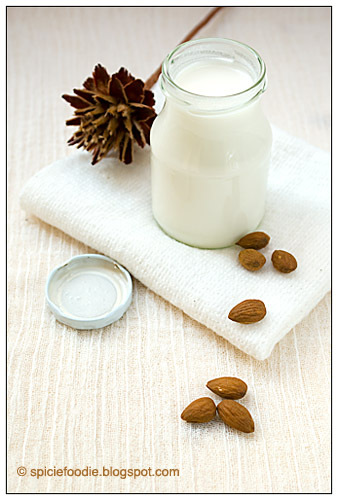 Wow…homemade almond milk…thanks for sharing..it is good for health and what more homemade ! @Jason, Hope you try making it. @Lindsay, It is delicious! It would go perfect with granola, you could even add some vanilla extract for a different flavor. @Elin, Yes healthy and delicious! You too have a great day. I love almond milk and it makes a nice blanc fromage. Grand recipe and oh that photo of the milk is stunning. hmmm.. how about almond pannacotta? I want to try this, I think I would have not liked the separating either. I haven't had almond milk in years, time for a revisit. I hope you are having and nice and warm week. The photos are stunning as always. I love almond milk but have only ever had the kind that you buy in the store- I've never tried to make it myself. This sounds like a wonderful alternative to store bought- especially since you've figured out how to keep it from separating. I will try this! @Claudia, Thanks for the tip I'll look into the blanc fromage. @Penny, Oh that sounds great! I might give it a go soon. @Gina, Yes time for a revisit 🙂 Thank we have been having beautiful weather, so happy. @Scrambledhenfruit, I hope you do try it! How clever! I love that you went back and tweaked a recipe so that it would look good. My kind of gal! Hi Nancy! I love almond milk too, but I've never made my own. I bet your homemade recipe renders an awesome milk. Yum! Ooh, and I bet heating it not only keeps it from separating for tea but also probably helps it keep longer-maybe?! Thanks for the post on almond milk… I'm already thinking of other ways to use it. Congratulations for making the top nine! i love almond milk!!! i can't wait to try to make my own :)! @Stella, Yes I think it does last longer by boiling it. I did notice the taste was much better on the cooked than the raw after 3 days. @Marta, Almond milk ice cream sounds delish! @Cakewiz, Thank you:) I also prefer almond milk to regular milk, the taste is way better. Yes cardamom and almonds go so well together. @Junia, I hope you love it . Way cool! I've used almond flour in breads before, but now I'm going to have to try your almond milk. Beautiful photos, too. Thanks! wow! this is gorgeous. It wouldn't even come to my mind to make almond milk but you have made it look so doable. Thanks for sharing and congrats on top 9. I'm always on the lookout for a good almond milk recipe and I think I may have found the perfect one. You really did a fantastic job of simplifying making almond milk. I may have to give almond milk a try! Cool idea! Never would have thought to make almond milk at home! Very cool. I really like the taste of almond milk too. I love almond milk! I just didn't think to ever make it at home… thank you for sharing the recipe, I will definitely give this a try. Great tip for stabilizing the milk. I've been making almond milk for about 2 years now and don't really mind the separating but I have tried using lecithin which works well but I find it leaves a bit of a funky taste. I can't wait to try your idea. I love this – I only really drink almond milk these days anyway and can't wait to try making it at home! Brilliant! We are always on the search for non-dairy alternatives and I am so looking forward to trying this out. What a great tip, I've been making nut milks for a long time now and this will certainly come in handy. I've always wondered why my homemade milks separated but the store bought ones didn't seem to, this must be the reason. Great timing Nancy, I'm trying out non-dairy milks at the moment! Up to rice milk now and enjoying that, but I think I'll definitely be trying almond milk now after your glowing review 🙂 Thank you! Looks really delicious and healthy too. Will definitely try this out! Thanks a lot! I am so going to try this–thank you! how have i never seen your blog before? love this!!!! thanks for the tip! to make coconut milk the recipes I’ve seen call for the shreds & water to be heated on low…..I’m imagining for maximum extraction of nutrients & coconut flavor. I was wondering why the almonds weren’t being heated as well at least heating the mixture once they were ground up in the water for maximum extraction but thought maybe it would.give a weird after taste. So I ask do you think the almond mash mixture should be heated once mixed with water for further extraction or possibly to further soften the almonds (for machines other than vitamix) and return to be blended again? Or you think heating them wouldn’t really do much and can be reserved for after straining and for binding purposes only? Also do you think the heat will damage the nutrients of the milk? Just curious because heat is needed in coconut milk.and is a good thing. The only time I’ve heard of heating the water for coconut milk is when using desiccated coconut. But I’m not an expert at making coconut milk from scratch or from a fresh coconut. My experienced has been that when heating the almond milk it can quickly curdle. I couldn’t tell you if or how heating damages the nutrients. I have a basic and not very powerful blender that I use, and haven’t run across grinding problems. As long as you soak the almonds overnight they will be soften enough to blend. Also blend them in small batches so that you can extract as much flavor as possible. Ok that sounds good. So the heat definitely needs.to be very low for the 15min time duration you recommend heating it to prevent separation correct? I don’t want it to curdle. Thanks for the update. Yes unfortunately I have experienced that with batches I haven’t kept on eye on and allowed to boil. Like you giving it a hard shake kept it together. I don’t recommend bringing it to a boil. Just keep the heat very low, like you did, for the entire time. Are you saying it separated in the coffee? If so first pour the almond milk into the mug then add the coffee to it. I don’t understand the physics behind it but it just works:) But sometimes if the coffee is extra strong the acidity can cause it to separate. It is really sensitive as you can see. Hopes this helps. I dropped by your website by chance and am very impressed by your attractive pictures and make me want to try almond milk! I am wondering if there has been any change in taste when you boiled the almond milk compared to raw almond milk. I know milk does when it’s boiled.. In fact the taste does change a bit. It depends on the almond variety I use and also the age but sometimes the almond taste is stronger raw. This is one of those recipes where experimenting really helps. Good luck & enjoy! Hi, Have you ever tried making the milk with unblanched almonds? I might be too busy or lazy to peel almonds! I have a couple of times. Just be careful because the skin may possibly cause curdling. Maybe make it raw or don’t heat afterwards. Of course you could also just buy blanche almonds. Good luck. I’m so happy I found your website!! A friend told me to try almond milk in place of cow’s milk, because of lactose intolerance. I’ve bought the commercial almond milk, but not only is it expensive, it has extra ingredients in it I don’t want. I made one batch of the milk from paste, but it was grainy, and also separated. Now I will try it again using a fine sieve, and also try heating it to see if I can keep it from separating. Another thing; I’ve heard it’s best to use unpastuerized almonds (which may be available only on the Internet because I guess all almonds in stores are pastuerized so they have a longer shelf life). Can you tell me if there is a difference in the milk using the raw almonds instead of the blanched or pastuerized? Thank you! A thought and a question on this, as I make homemade almond milk all the time. I am too lazy to blanch and peel the almonds, although it is desirable to do so for both taste and for the almond meal/flour byproduct. My almond milk separates in the fridge, but as you pointed out, a quick shake and all is good. My question would be regarding nutrition – what happens to the enzymes and such when you boil the milk? Are they destroyed? Also, to thicken my almond milk, I add one cup of pre-hydrated chia seeds to the already strained milk, whiz it up in my vitamix, then strain it again. This is the closest I’ve come to the thickness that exists in the store-bought almond milk. I currently sweeten it with Stevia drops, but am thinking I may try date syrup soon and see how it works out. That’s a good question, and in all honesty I haven’t a clue what happens nutrition wise when boiling the milk. Thanks for the tip on the chia seeds! I like my milk unsweetened but date syrup tastes wonderful so I’ll have to try it on my next batch. 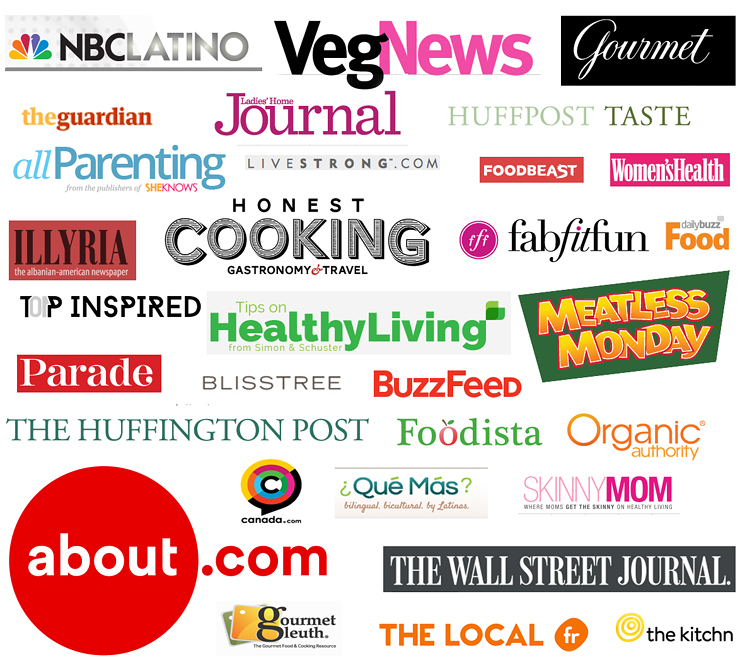 While searching for how to make almond milk so that it won’t separate, I found your blog. Thanks so much for the tips! I’m new at this homemade milk, and want to try your method! I heated the almond milk and it thickened right up like pudding! Help! I apologise your comment was trapped (for some reason) in the spam filter. That is strange that your almond milk turn to pudding — I’ve never had that happen. i want to thx u for sharing ur recipe , i have been making almond milk for while now and now i make it with slow juicer which make it even better ! i have question what temperature u let it simmer for ? do u bring it to boil ? and if i bring it to boil would it matter ? . Hi! I’m sorry but I didn’t use a thermometer, I would advice that you not bring it to the boil. Just let it simmer under low-medium heat and keep an eye on it. I think you may need to try it a couple of times to perfect the exact technique that works in your kitchen conditions. This is the best almond recipe I have made so far. Its so lovely and creamy and thick. I did add nutmeg, cinnamon and vanilla to mine. Definitely try it!! Thank you! Nutmeg sounds fantastic, I’ll be sure to try it next time. Hi Dawn, I’ve never had store-bought almond milk separate in coffee or tea. Sorry to hear you have had that issue. Have fun experimenting.